The Bulldogs are rolling on thanks to a 38-7 win, and their playoff hopes are still alive. Rivalry weekend has tripped up many a playoff/BCS contender in the past, and Georgia has played some dramatic and frankly weird games against their most hated rivals, Georgia Tech, in recent years. This all should have combined for a recipe to put the Bulldogs on upset alert Saturday in one of the many important rivalry games this weekend. Instead, Georgia cruised to their ninth-straight win over Tech in Atlanta, picking up a 38-7 victory and setting up a de facto playoff quarterfinal in the SEC title game next weekend. Georgia was never really tested by the Yellow Jackets, nor fazed by the triple-option, which Kirby Smart’s team practiced for a little bit at the end of each practice to be ready for what Paul Johnson would throw at them. Georgia’s defense has been firm and strong in basically every game this season except against Auburn, and that trend held today. Georgia has only given up more than 19 points twice this season, against Auburn and Missouri. And outside of a late first half touchdown drive, it never seemed as if the Yellow Jackets were really threatening the Bulldog defense. 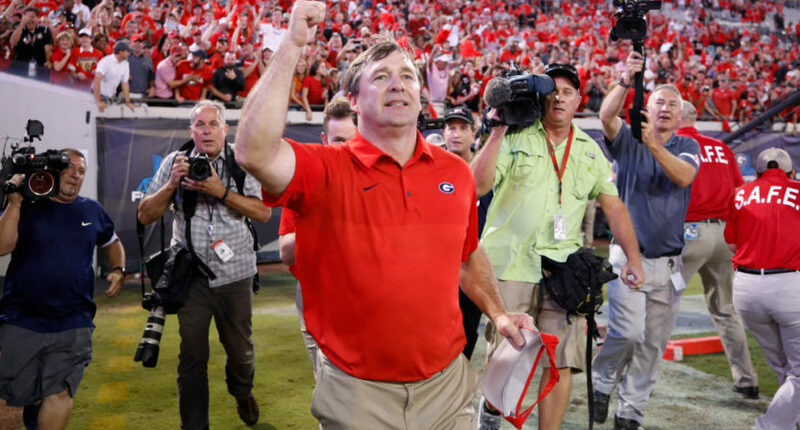 Bulldogs’ head coach Kirby Smart’s formula for success this year has been to ride running backs Nick Chubb and Sony Michel, and use them to take as much pressure off true freshman quarterback Jake Fromm as possible. While Fromm made the few throws he was asked to make against Tech, he was not asked to win a game that the defense and running backs took care of for him. While his ability to win games against the best teams in the country is still an open question, he has not been asked to do all that much in their 11 wins. In the dumpster fire that is the SEC East, that is all that was required for a division title. The Bulldogs are a cinch to make the Playoff if they beat either Alabama or Auburn next Saturday. But they’ll have to do far more than they did when they were beaten soundly by the Tigers two weeks ago. That day, Jake Fromm looked like a true freshman QB, while Jarrett Stidham and Kerryon Johnson combined to put together one of Auburn’s best performances of the season on offense. Whether Georgia plays the Tigers again, or goes up against an equally powerful offense from Alabama, the defense will need to stand tall first and foremost. But more importantly, Georgia’s hopes to beat either of the SEC West heavyweights may rely on the legs of Michel and Chubb. Against Auburn, they only ran for 48 yards. If that’s repeated, will make winning nearly impossible for the Bulldogs. If those two can find success, the pressure will be off Jake Fromm to make the few throws he is required to make, and with Javon Wimms and Terry Godwin, he has the receivers to throw to when necessary. Smart knows what his team can’t do if they are to win the SEC Title game next Saturday thanks to the tape from the Auburn game, and they’ll have to put together their best performance under Smart yet if they are to win. Should they win, they’ll likely be one of the four teams in the playoff and may well be in the Sugar Bowl semifinal on New Year’s Day. If they fall short again, it will join a long line of recent Bulldog teams to come so close to success, yet failing at the final attempt to grab it. This group has a great chance to right those historical wrongs, but it will take the game of their season to pull it off.